Mind with her second head, and Sadie in the background pretending Mina does not exist. 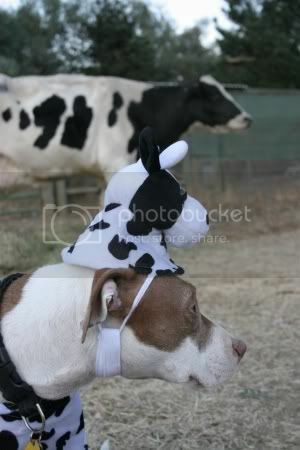 Mina is the best damn cow dog that I've ever seen! I absolutely love it!! Mina thanks you, though she prefers just being a dog. Sadie agrees. Was not expecting that. Really not expecting that. Scrolled down ye olde friends page and nearly snorted green tea. That can't be good for the nose. Tell Mina she's noble no matter what she's covered in. Green tea through the nose is good for you. Trust me. I know, I know - poor Mina, she definitely has a right to go on a rampage and eat a few mutant squirrels. Aw, thanks. She definitely didn't care for the cow head. At all. Awww, Mina looks so tired. Either that or she's trying to mock Sadie. More irked and tired than in a mocking mood. Mina doesn't mock, it isn't in her nature. She does, however, have the "Woe is me, I'm so pathetic" look down pat. SQUEEEEEEEEEEEEEEE!!!!! mina is gorgeous as always. My co-worker said "She's not fooling anyone with that thing." Agreed. Sadie was definitely not fooled. Claire, the pig, wasn't fooled. NO one was.